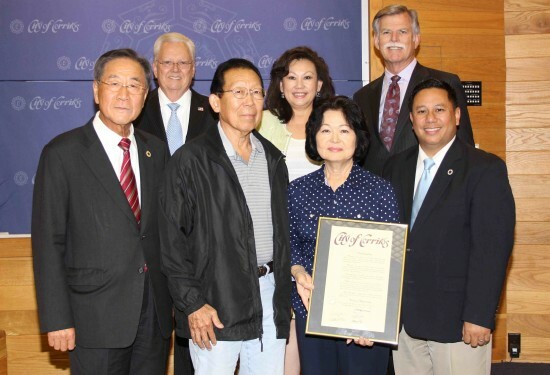 Front row, from right: Cerritos Mayor Mark Pulido, honoree Kimie Matsumoto and her husband Fred, City Councilmember Joseph Cho. Back row, from right: Councilmember Bruce Barrows, Mayor Pro Tem Carol Chen, Councilmember George Ray. 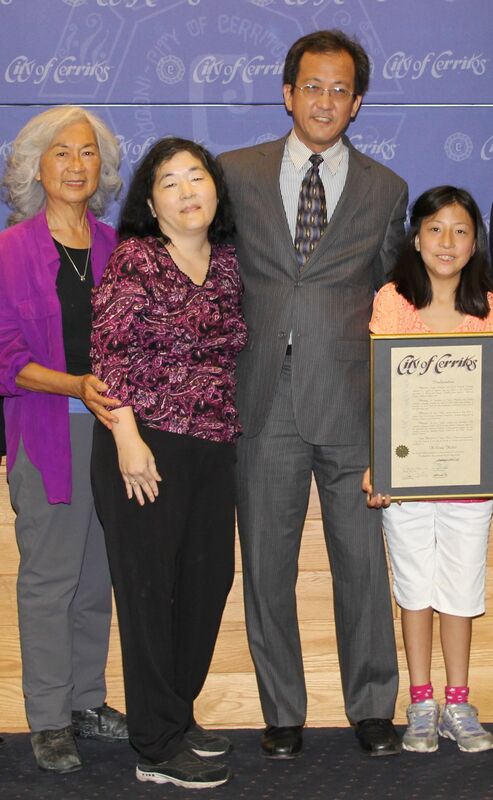 CERRITOS — In observance of Asian American and Pacific Islander Heritage Month, the Cerritos City Council on May 19 honored residents who have made contributions to American history, society and culture. Honoree H. Ernie Nishii with (from left) his mother Jane Nishii, wife Young Choi and daughter Yuni. • H. Ernie Nishii, whose efforts earned the Tuna Canyon Detention Station site a historical designation from the City of Los Angeles. During World War II, more than 2,000 people, mostly Japanese, Italian and German immigrants, were held there. Su was unable to attend the ceremony, but her two daughters accepted on her behalf. The City of Cerritos will also hold a celebration of Asian American and Pacific Islander Heritage Month on Thursday, May 29, at 7 p.m. at Cerritos Park East, 13234 E. 166th St. Performances by community organizations will include the Cerritos Senior Center Ukulele Group, Chinese Culture Association of Southern California, Da’ Hawaii Seniors Club, Oriental Moo Do School, and Club Kaibigan and Shanti Club from Whitney High School. Admission is free but seating is limited and will be available on a first-come, first- served basis. Light refreshments will be served. Honorees Gordon Hom, Hedy Harrison-Anduha and Chan-Young Kim.